Modern marriage is busy, distracted, and overloaded to extremes, with ever-increasing lists of things to do, superficial electronic connections, and interrupted moments. 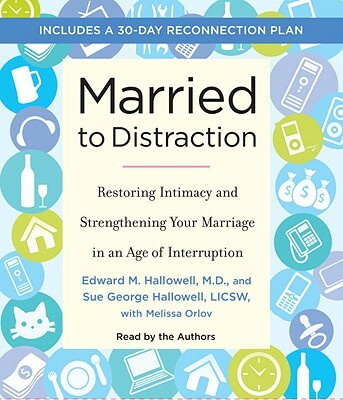 Now Edward M. Hallowell, the bestselling co-author of Driven to Distraction and Delivered from Distraction, teams up with his wife, Sue George Hallowell, a couples therapist, to explain the subtle but dangerous toll today's overstretched, undernurtured lifestyle takes on our most intimate relationship. The good news is that there are straightforward and effective ways to maneuver your marriage out of the destructive roadblocks created by the avalanche of busy living. Observe the natural sequence of sustaining love: attention, time, connection, and play. Develop and nurture empathy the essential building block to healthy communication. Carve out small moments of uninterrupted attention for each other. Identify the pressures that our crazybusy lifestyles put on love and marriage, and fight back with tenderness and appreciation. All of us who have been part of a couple for more than a few years will recognize ourselves in this reassuring book. Married to Distraction will set couples on a course of understanding, healing, and love. Edward M. Hallowell, M.D., was an instructor at Harvard Medical School for twenty years and is now the director of the Hallowell Centers for Cognitive and Emotional Health in Sudbury, Massachusetts, and New York City. He is the co-author of Delivered from Distraction and Driven to Distraction as well as the author of CrazyBusy, The Childhood Roots of Adult Happiness, and Worry. Visit him online at www.DrHallowell.com. Sue George Hallowell, LICSW, has been a practicing couples therapist for more than twenty-five years."